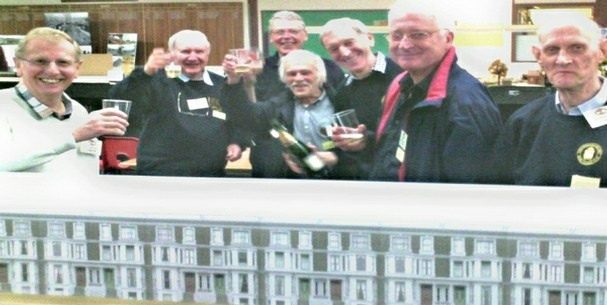 Twickenham & District Model Railway Club was formed in 1961 and established a home in Richmond-upon-Thames. Over the years the club has been fortunate to have many fine modellers within it’s membership and has trained many more. A move to our current location in 2004 has provided the opportunity for a number of exciting new projects. 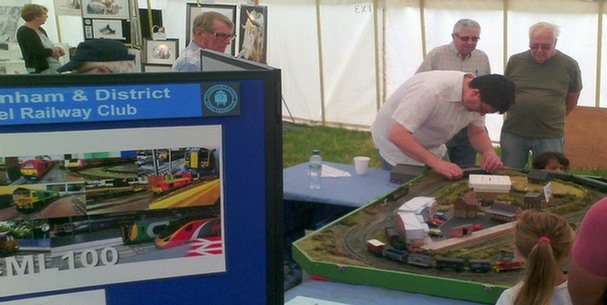 Setting up Drive-a-train and the club promotional stand at Chertsey Agricultural Show. A very popular layout with junior engine drivers. 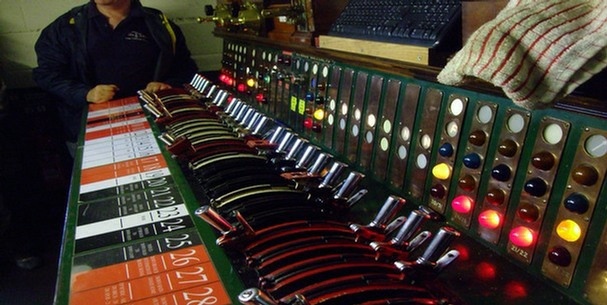 The lever frame of a signal box on the miniature Great Cockcrow Railway. The club visit also included a special double headed train and workshop visit at this popular railway. We encourage participation in exhibitions and hold an annual Open Day. Not all types of layout are built in the Club, but there is usually help on hand for home layout problems. You can find us on the Twickenham - Hounslow borders in West London with easy access from major roads and rail stations. With six layout projects in various scales and themes, our sixty members would be delighted to welcome you to the club on a Friday evening, regardless of your experience or ability. To learn more, please take a trip around this website. All enquiries are welcomed and we promise a quick response. 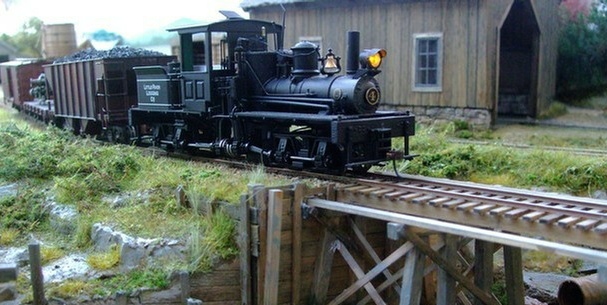 The club has modelling projects in popular scales and gauges at various stages of build or completion; you can see more of these on our layouts pages. A small workshop is surrounded by a well stocked book and DVD lending library to provide reference works and inspiration. A circular multi-gauge (about 12) running track provides test facilities ranging from from ‘Z’ to ‘G’, including some for three rail use. At exhibitions our layouts aim to operate appropriate trains based on the layout theme, but in the clubroom any models are welcome on the layouts. Our clubroom belongs to a local Scout group. It has an almost level access, two shallow steps lead to the front doors. The main hall has space for several layouts to be erected at the same time, whilst layout storage is on wheeled trolleys with a level access to our own storage unit, providing easy access with minimal lifting. Finally, no self respecting club is complete without a kitchen for tea, coffee and snacks, ours is no exception!